The different leaders we have seen in Sri Lanka in the last 40 years beginning with JRJ to the current President were very different in their approach to power and authority, based on their cultural values and understandings of the leadership style. In order to understand about leadership, we need to first understand about power and authority. Power is the ability to get what one wants. Power that comes through moral persuasion can be seen as ‘legitimate authority’. On the other hand, socially-legitimated power is defined as authority. The Sri Lankan ethos today is to look to strong leaders to solve problems rather than to institutions. Whenever people have a problem, they will look for a politician they know within the system to whom they can appeal to, rather than rely on the institutions to deliver like in the West. The common discourse today regarding politics is the need for decisive and just leaders – people who can make credible decisions quickly and stick to them once they are made. Being decisive does not mean being hasty; being decisive means knowing when to take a decision. The primary aspiration of a disgruntled population who vote for change in the hope of their betterment is that they are looking for stability and order and for a strong political direction that will not waffle. To most of those people the current Government has been a bit of a disappointment, because of the slowness in decision making. This is largely because it is a coalition of two parties, each of which are going their own way because of their ideology and political ambitions. The government has only been able to move by fits and starts. The outcome therefore of the concluded LG election a few months ago to the ordinary people of this country was certainly not a shocker. It was however a shock for the ruling elite because they never had their ears to the ground. Interestingly, 15.7 million voters were eligible to vote at the 2018 LG elections according to 2017 listings. Out of that only 11.2 million voted. Around 4.5 million boycotted LG elections to perhaps show their frustration with the current administration; 4.5 million silent dissenting voices is massive in any democracy. It is time our politicians understand the public is getting fed up with all the current political parties and have shown their dissent very silently. Even after a few months after the election defeat the leaders so far have been slow to take measures to restore confidence in the Government. The governance of the country needs to take a new direction at least in the next 12 months for all our citizens to witness real social, political and economic advancement of our nation. The President and Prime Minister would find it very hard to abandon the promises they made because the next presidential election is only 15 months away and Parliamentary polls are not due for two years. Moreover 6.2 million people voted for the National Unity Government with so much of hope. 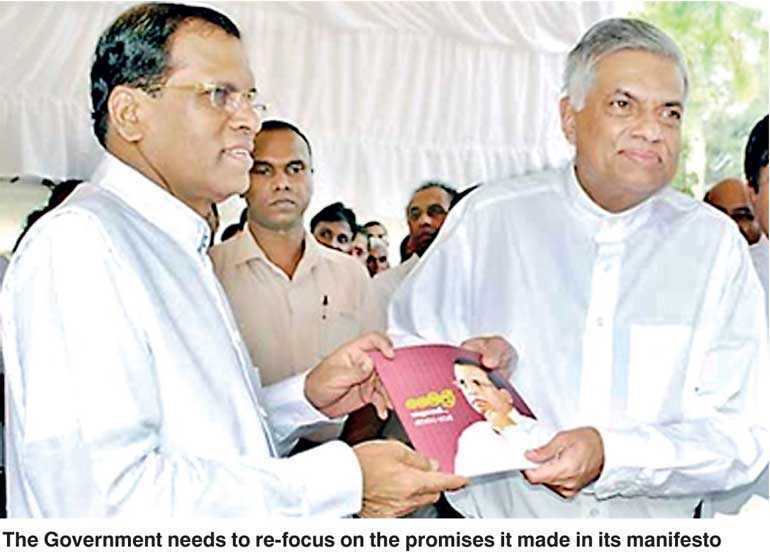 On the other hand, the Government’s true strength, and which is in the national interest, is that the two-party alliance of UNP and SLFP work together and have further engagement with the ethnic minority parties to find a political solution to the ethnic conflict which is the country’s long-unresolved problem. The ground reality is that the public perception is that the Government is not very effective and not doing much, this is not an accurate description of the reality. Development projects are taking off with international support. The Government has brought in a variety of new laws, the most important of which is the 19th Amendment to the Constitution. The 19th Amendment in particular could not have been passed if not for the current Government. The media is filled with statements by Opposition leaders who are giving dire warnings about the actions of the Government and state of the economy. Unfortunately for the Government, very few Ministers come out openly to defend the Government. In addition, the State media does very little to minimise the misinformation effectively. No doubt at the last LG election the strength of the UNP was reduced to 32.5%, while the President’s SLFP was reduced to 13%. Political analysts say the decision to cut the farmer subsidies to the bone was a disaster for the Government. Prices of essential items like coconut, rice and sprats have skyrocketed. Sri Lankan people sadly have short memories. In 2015, the petrol that was at 162 was reduced to 117, kerosene from 110 to 44 and a 410 gram milk packet from Rs. 465 to Rs. 325 and electricity bills by 25%. But the fact that VAT was increased in general from 12% to 15% and the interest rates going up and the depreciation of the rupee has had an overwhelming impact on COL. Therefore, going forward, the Government should focus on issues that can help alleviate the suffering of the people. The people want the price of food (onions, potatoes, lentils, sprats, milk powder, coconut, dry fish) reduced. The Government needs to ensure there is enough rice in stock for the next six months. Then the farmer and rural enterprises issues need addressing. There is today a drinking water shortage in five provinces. All this clearly needs addressing by the Government. For the Unity Government to once again become a beacon of hope and win the trust of the people, the President and Prime Minister both need to act with responsibility and maintain discipline among their ranks by getting rid of the people around them if directly accused of bribery and corruption and focus on addressing the common man’s problems without unnecessary delays.